La Hacienda is one of the best Mexican restaurants in Southeastern Michigan. Great food. Decent service. Moderate prices. They take credit cards. And, oh yeah - they have a full bar, which, for those who know me, is a very important consideration. You really can't ask for much more than that. Plus, as if all of that wasn't enough, they are located in the heart of Warrendale - on the north side of W. Warren Avenue (18712 W. Warren Ave., Detroit 48228 - (313) 271-6677). The place is also run by a family that truly cares about this community. I'm personally fond of their frajitas, but everything on their menu is exceptional. 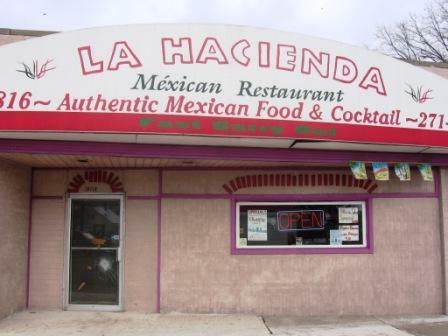 Regretably, all is not well for La Hacienda. In case you didn't notice in the above photo, someone recently smashed the glass door to their restaurant. They were presumably trying to break-in. Luckily, the owners have a heavy sheet of plastic behind the glass. 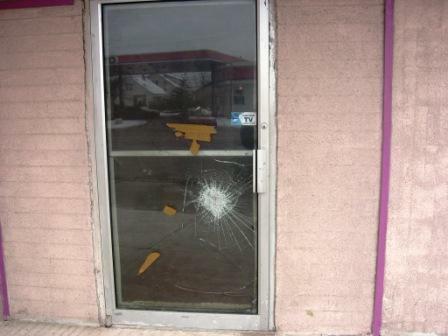 When someone smashes the glass, they still aren't able to gain entry to the building. I talked with the owner. He is committed to staying in the Warrendale neighborhood, but stuff like this makes it a lot harder for him to do that. All of this makes me want to take a couple of wacks at whoever it was that smashed their door. Unfortunately, I doubt I'll ever find out who the culprit is. How expensive are those security cameras? There's also the option of Warrendale residents starting a citizens' patrol (baseball bats optional ;)). Or how about neighbours pooling funds to hire an unemployed police officer to patrol the area at night?